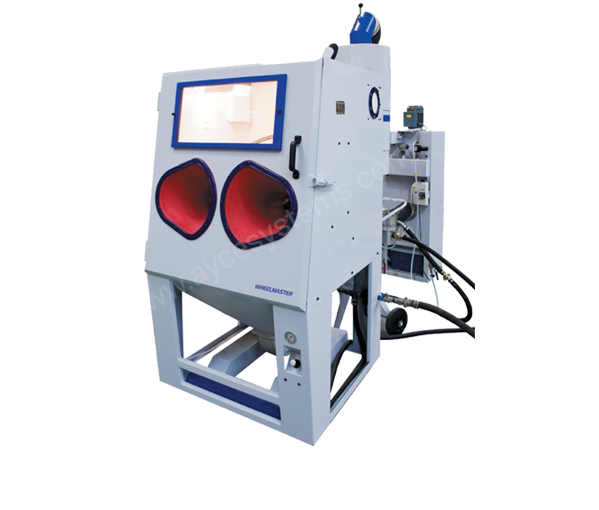 A purpose built shot blast cabinet, designed for the volume wheel repairer. Specifically designed for blast etching alloy wheels, and incorporates many application specific handling features that enable the operator to use this wheel blasting system safely, without heavy lifting. Part of our extensive range of ALLOY WHEEL REPAIR EQUIPMENT - click the link to take a look at what else we offer! Reduces wheel preparation time down to as little as 2 minutes per wheel. Can be used for light etching prior to painting (suction fed) or complete stripping of old coatings (pressure fed). The perfect machine for the effective, timely and safe etching of alloy wheels in garage and specialist wheel repair environments. Please call 01535 691888 or email sales@aycesystems.co.uk for a full quote and to arrange demonstration. * Finance example based on a 5 year lease agreement with 10% deposit. Finance subject to status. Other finance options available. All prices exclude VAT at 20%. Price, availability and specification may change without prior notice. For more information about our Alloy Wheel Shotblaster Cabinet click the button below to download the print friendly PDF brochure, or if you would like to receive a quote for this system, please click the request a quote button. Ayce Systems is proud to be THE leading UK supplier of SMART and Alloy Repair Systems, consumables and after-care support to the automotive refinish industry. This unrivalled service is supported by our state-of-the-art practical training programmes, covering all aspects of the SMART and Alloy repair industry.